In the early years of the new Germany, however, ‘the German Imperial Navy was subordinated to the land-based military strategy of the German Army’. The Navy’s task was mostly mere coastal defence. When Kaiser Wilhelm came to the throne, the Germany he inherited was much changed. The German economy was taking off and its economic muscle was starting to be felt across the world’s seas. With growth came demand for raw materials and markets. Wilhelm felt that it was high time for Germany, like the other great European nations, to also have its ‘place in the sun’. 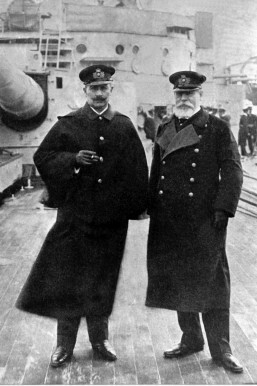 Kaiser Wilhelm II with Admiral von Holtzendorf, the architect of Germany’s 1917-1918 Unrestricted submarine campaign. 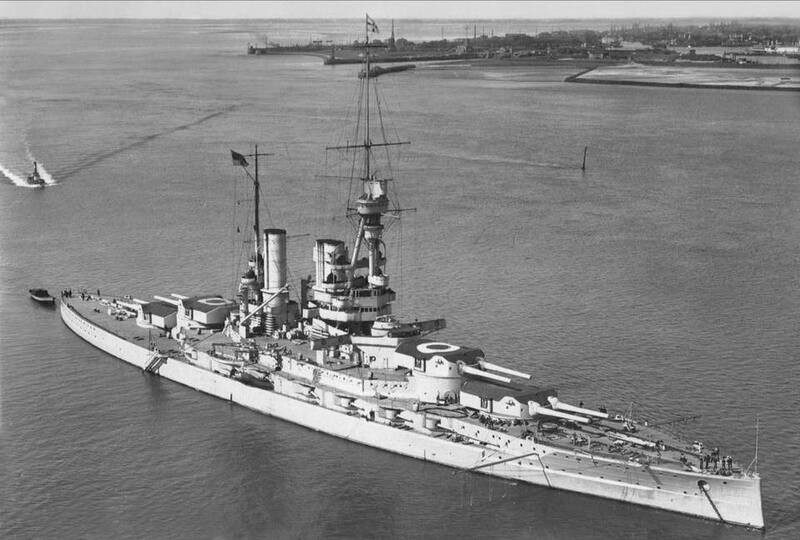 Wilhelm wanted to build a cruiser Fleet as an instrument that would not only carry Germany’s flag around the world, but one that could also counter British dominance of world trade. 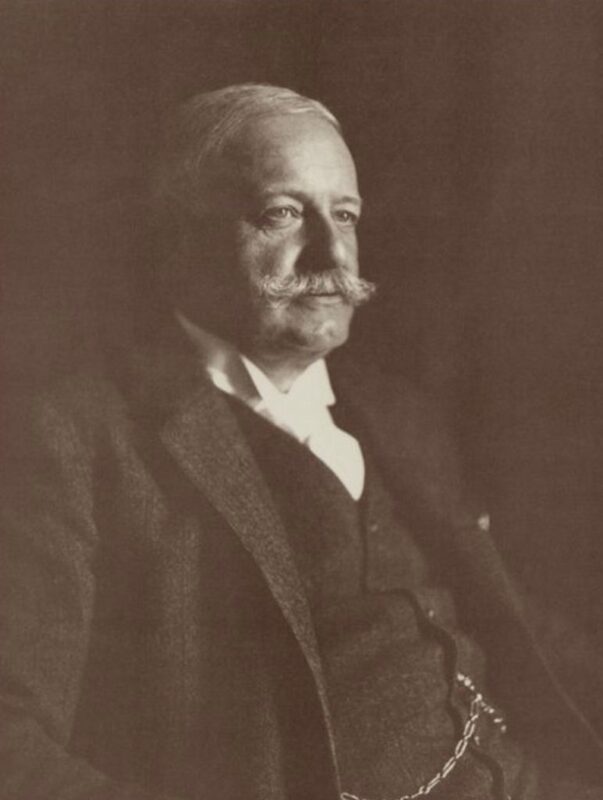 Wilhelm needed a long-term strategy to exploit Britain’s diplomatic weaknesses while the instrument to challenge her maritime power was still being built with great secrecy. For that task, Wilhelm relied on two men. One was Alfred Tirpitz, the other, Bernard von Bülow. Tirpitz would build the Kaiser’s new weapon, here Navy, while von Bülow would keep Germany diplomatically protected. 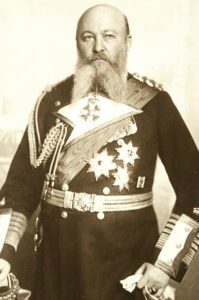 Admiral of the Fleet, Alfred von Tirpitz. (Author’s Collection). With the passing of the so-called First Navy Law, Tirpitz established the first foundation of the new Navy in 1897. The Fleet that Tirpitz decided to build would be one suited for ‘home-water’, North Sea, operations rather than for far-flung colonial expansion and support. The weight-savings benefits from building smaller-range ships could be directly transferred to heavier armour and wider beams, the latter providing his ships both more stable and more protected gunnery platforms for his ships. As far as armament was concerned, rather than compete on gunnery calibre, Tirpitz’s focus would be on the gun’s muzzle velocity and the design of munitions. His preference would pay handsome dividends. 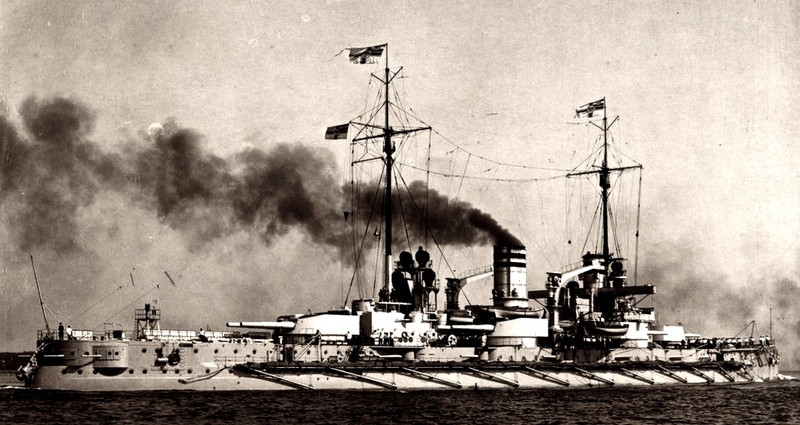 Tirpitz’s goal was to build a Fleet that, by 1905, would consist of nineteen battleships and forty-six cruisers. It wouldn’t take long for him to see German naval construction as a more important threat from the French or the Russians: ‘The more the composition of the new German Fleet is examined, the clearer it becomes that it is designed for a possible conflict with the British Fleet’. New military harbours like Wilhelmshaven were created and n close partnership with shipbuilders like Blohm und Voss, Schichau, Germanianwerft and Kaiserlchewerft, a long list of new ships built. 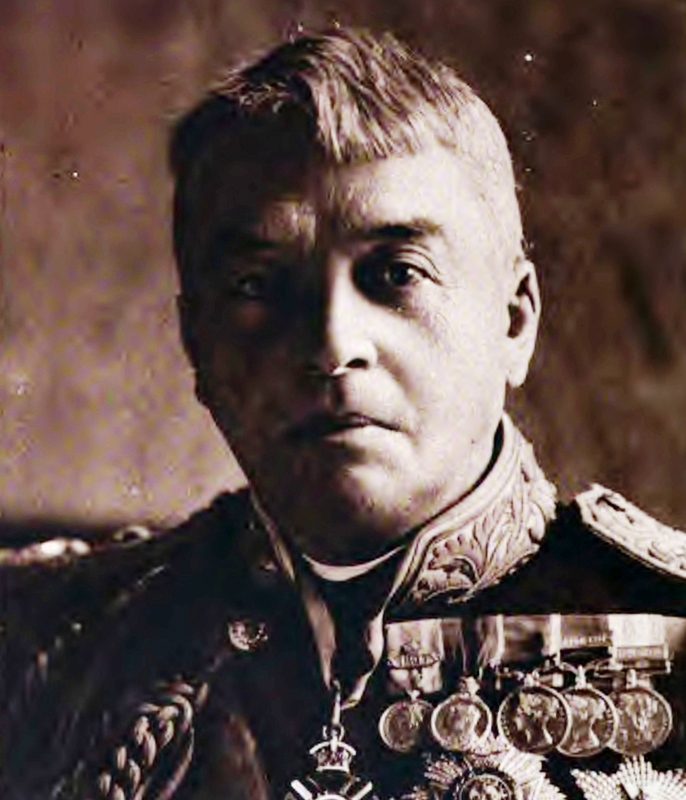 Admiral Sir John Fisher knew that Britain had to prepare for the threat. 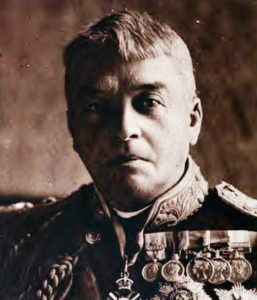 Admiral Sir John ‘Jacky’ Fisher. John Jellicoe’s mentor. A new Atlantic Fleet was created from the former Channel Fleet and moved to Gibraltar, a critical geographic pivot-point. It could reinforce either the North Sea or send ships east in to the Mediterranean. For him, less could be better. Ships that were ‘too weak to fight and too slow to run away’ were simply cut. At the stroke of a pen. 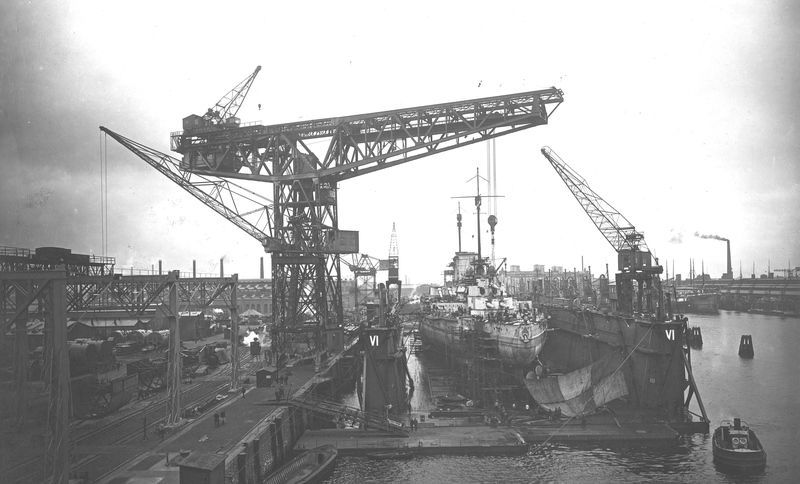 Ninety ships crews were paid off and another sixty-four put into reserve. Arguably the British now badly stoked the fire and gave Tirpitz all the ammunition that he needed to openly accelerate German Fleet construction. 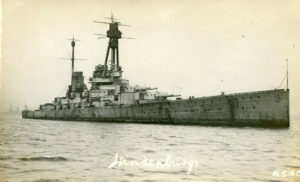 The Admiralty Committee on Designs spearheaded the two great innovations with which Fisher’s name is so closely associated: the revolutionary new battleship, HMS Dreadnought, and the equally dramatic development, the battle-cruiser, HMS Invincible. 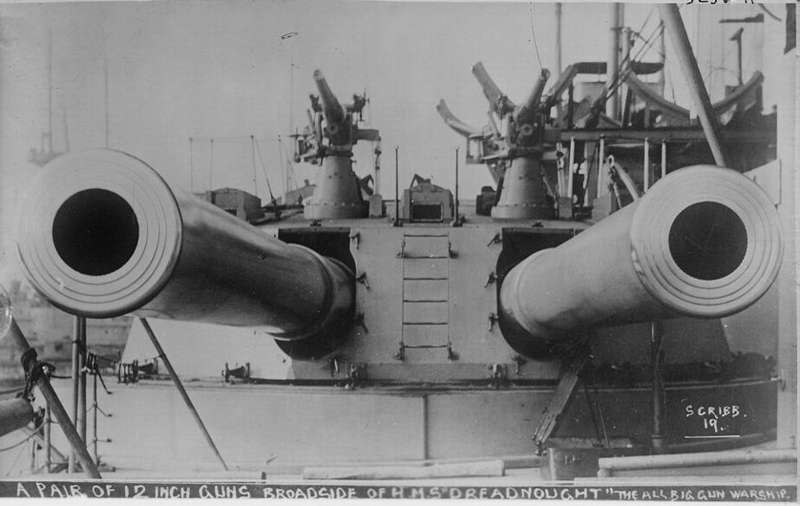 HMS Dreadnought (1906). With her building, Britain effectively ‘levelled the playing field’. 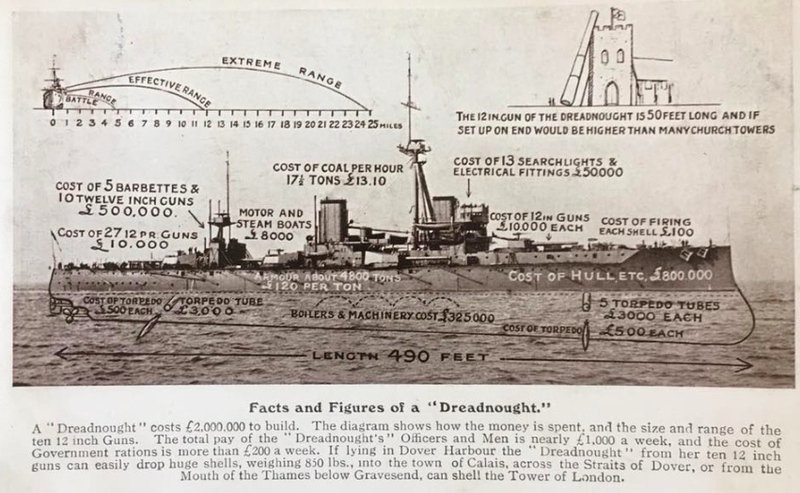 Dreadnought‘s powerful 12in guns and armour re-defined new battleship design. The cost of building a new dreadnought Navy put social reform on hold and raised expectations on their future value. Tirpitz now had the perfect rationale for accelerating the shipbuilding programme. Germany saw that there was a chance now to pull ahead. 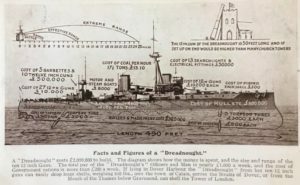 ‘The huge British superiority in pre-dreadnoughts would become increasingly irrelevant as both sides built more dreadnoughts’. 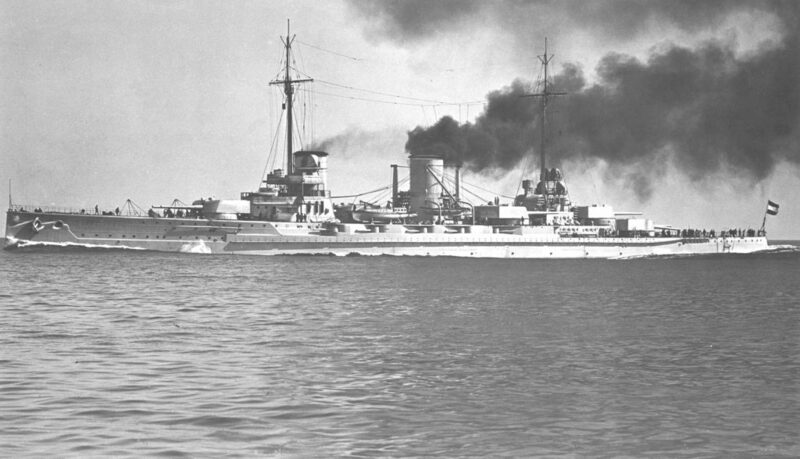 Germany’s answer was SMS Nassau. 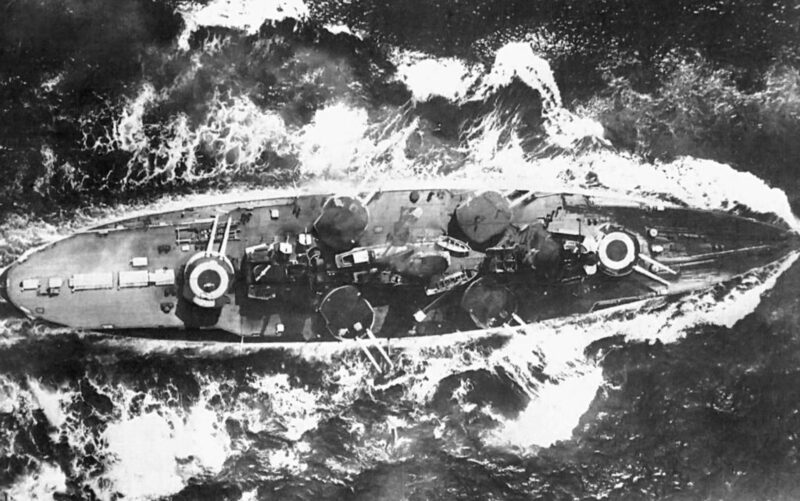 An overhead photo of Nassau, shows her unusual turret layout, two fore and aft on the centreline, two on each side amidships. 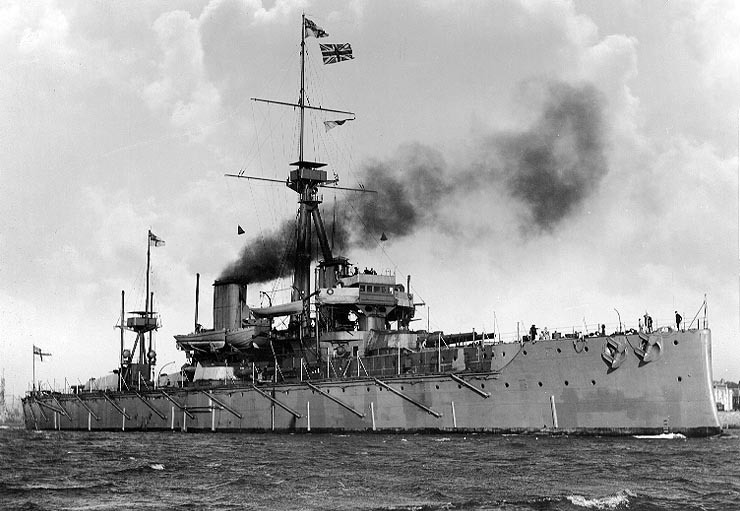 When the naval war came, it was the battle-cruisers that took the brunt of the action. Moltke and Seydlitz were at all four actions, Yarmouth, Hartlepool, Dogger and Jutland. 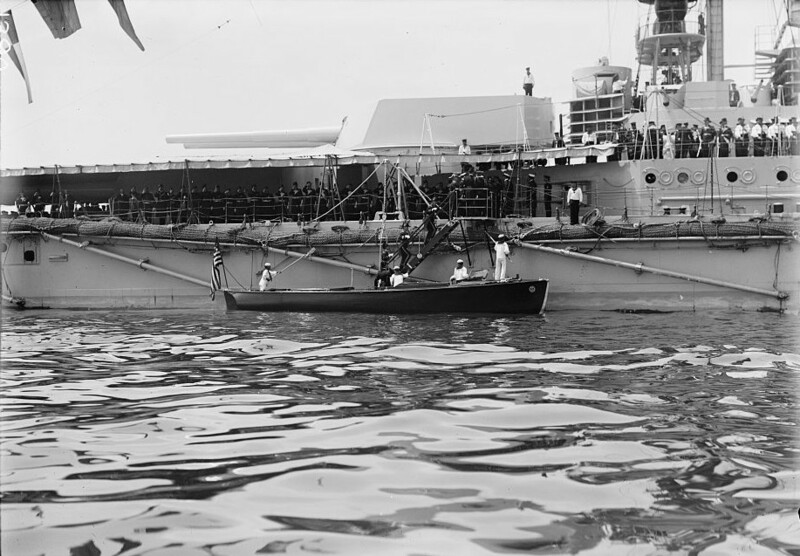 Moltke in US waters in 1912. Von der Tann at three, Derfflinger at two and Lützow only at one, Jutland, where she had to be scuttled by two of her own torpedo boat escorts. Hindenburg wouldn’t be commissioned until May 1917. To the end, the two great Fleets competed on design. The new 15in gunned Queen Elizabeth class were in time for Jutland. Germany’s response, the Baden class, would never fight the British on the North Sea. 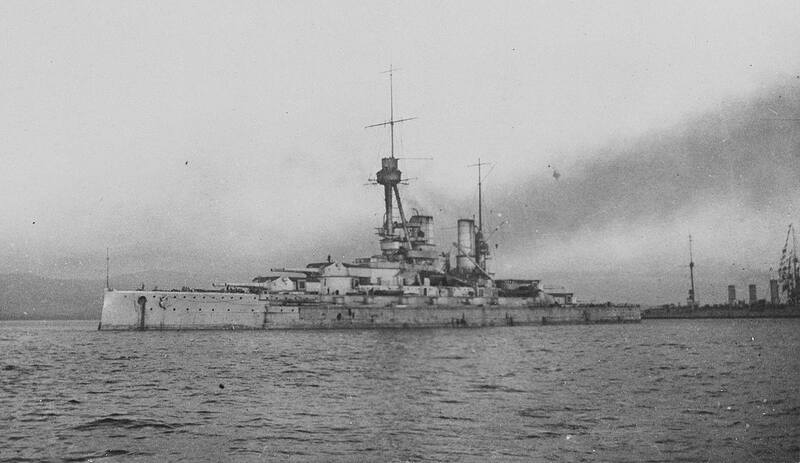 Two of her class, Baden and Bayern, would be interned at Scapa Flow. One would be sunk, the other beached. 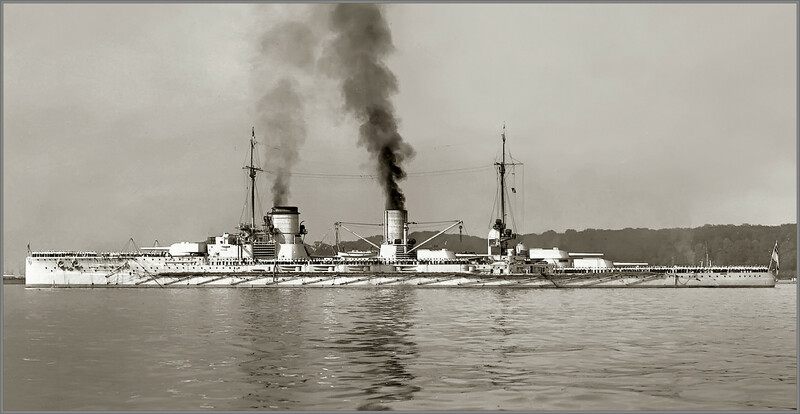 SMS Baden. The new battleship class was Germany’s answer to Britain’s Queen Elizabeth class. On the day, she would be successfully beached on Swanbister Bay. Baden‘s sister ship, Bayern. She would be sunk in Scapa Flow. Her heavy turrets fell off during her lifting.